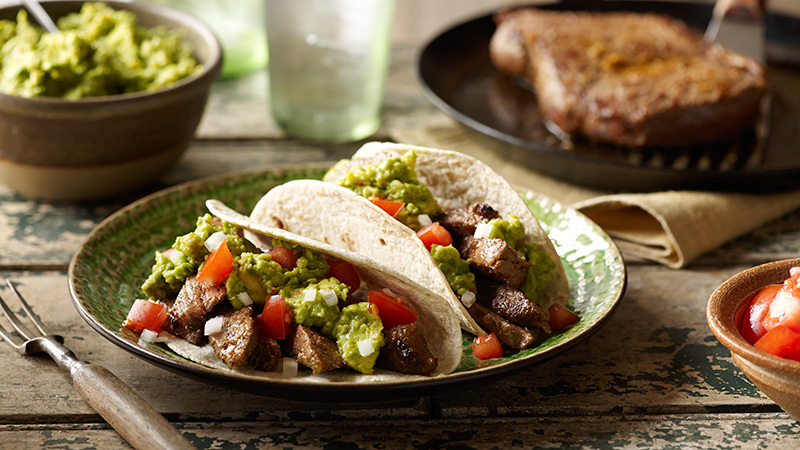 Carne Asada literally translated means “grilled meat”, most often beef. It is traditionally prepared by marinating the beef in citrus juice, spices and a pinch of salt. This style of taco is particularly popular in the northern states of Mexico. For a more intense and delicious flavour why not marinate your steak overnight in the fridge or in the summer months give your friends an extra treat special treat by grilling your steak on the BBQ. Mix water, 2 tbsp vegetable oil, lime juice and the Carne Asada Steak Seasoning in a bowl. Add the whole pieces of steak (unsliced) and turn to coat on both sides. Marinate for 10 minutes or more. Halve and stone the avocado then scoop into a bowl and mash with a fork. Add the Guacamole Seasoning and mix until well combined. Heat 1 tbsp vegetable oil in a large frying pan over medium/high heat and add steak discarding any remaining marinade mixture. Cook 4 minutes each side for a medium cook or until cooked to your liking. Remove to a plate, cover with foil and rest for 10 minutes. Slice steak across the grain into thin strips. Return to pan and combine with pan juices. To pan-toast heat a non-stick frying pan over a medium heat and brown each tortilla for 10 seconds on one side only. Wrap in a tea towel until read to serve. Or to microwave, piece the packaging and place the whole pack in the microwave. Heat for 35-40 seconds on full power (650-800watts). Open the pack, separate the tortillas and keep them covered until ready to serve. Take a tortilla, place on your sliced steak and top with a dollop of your guacamole and to finish off with even more flavour sprinkle on some onions and diced tomatoes. Enjoy!